Asker is an affluent suburb of Oslo. It's where Crown Prince Haakon and his family have their home. The city is known for its many beaches and wooded trails, as well as shopping options and beautiful churches. We went to check out the Galleri Trafo . The gallery opened in 2006 and, according to the VisitAsker website, "has rapidly become an important location for Norwegian and International contemporary art." 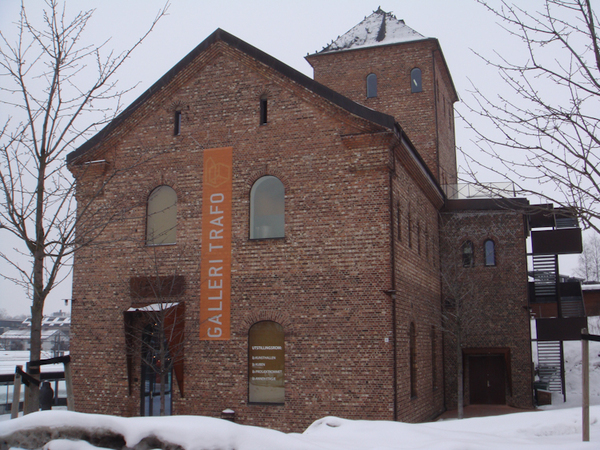 Housed in an old brick factory building adjacent to the Asker train station, the gallery includes three separate viewing areas on the first floor and one additional exhibit hall on the third. As we stomped the snow off our boots at the entrance, I asked the lady at the desk for two tickets. She looked puzzled. Turns out the gallery is open for free to the public! Exhibitions change periodically, but the gallery's website seems to be fairly up-to-date. In Kunsthallen (The Art Hall), we examined a series of contemporary landscapes by Norwegian artist Espen Røise . I stood in front of the focal piece for a long time, taking in the color and movement, the choice of shape. As the artist notes on the website, "Everything I do in my studio has its beginnings in the time I spend in nature, the landscape that touches me." 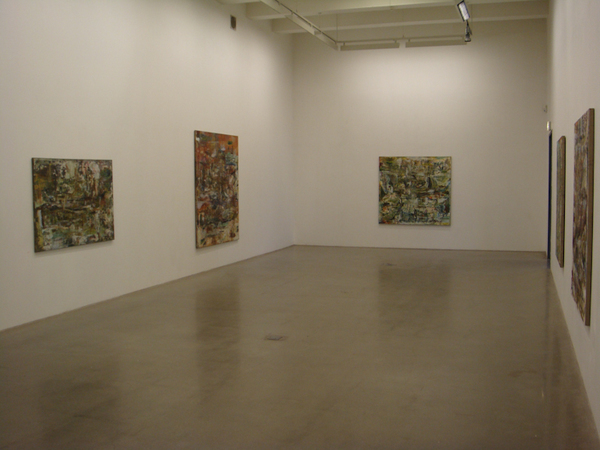 Unfortunately, I couldn't remain soothed by these large, abstract paintings. From behind the wall at the far end of the room came a blood-curdling scream! Someone gasping for breath, panting, crying. Jonathan and I looked at each other, eyebrows raised, and walked toward the sounds. An exit originally hidden from view led to Prosjektrommet (The Project Room) where a film installation titled "Something between the real..." was being screened on loop. We sat to watch Portuguese artist Margarida Paiva 's demonstration of the chaotic media miscommunication which follows a random act of violence. He uses a fragmented combination of real life news stories and staged videos, like a cross between a movie and a documentary, to make his point. Ultimately, we didn't stay to watch the whole thing because the mood was so sinister, I worried I was about to see something terribly and unforgettably violent. We were almost the only people in the gallery on that Saturday afternoon, so it was easy to explore. 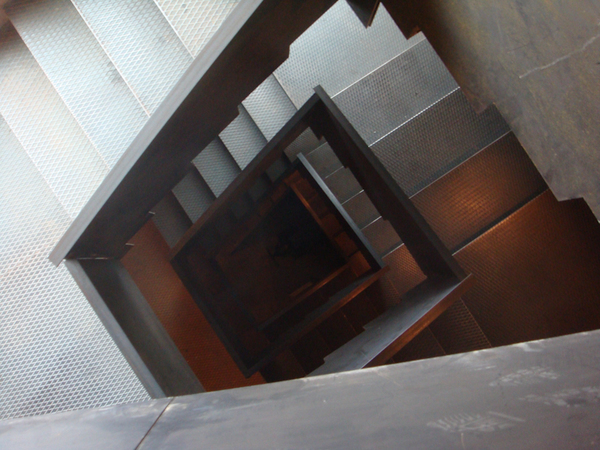 We walked up the back staircase to the third floor to visit a photography exhibit. Two redheaded girls wading into a lake full of lily pads. "I could never do that," I said aloud to Jonathan. "Walk barefoot into a lily-padded lake." "It is when I use it." I didn't catch the name of the artist, and the website doesn't appear to have been updated with this info yet. Finally, before we left, we returned to the first floor to visit Kuben (The Cube), a small, square room behind the reception area. Approaching the room, we could see it fill with red light. After a beat, the light would disappear. Over and over. Like a giant's heartbeat at rest. Peering through the entrance, we found ourselves face to face with "Mann, nisse, satan" by Stein Koksvik . 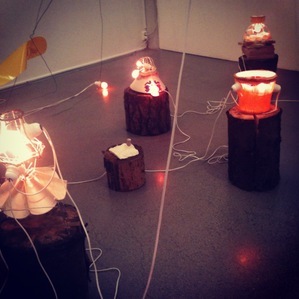 Ten short stumps supporting ten different light fixtures, each a deconstructed lamp with one or more red light bulbs. Every few seconds, the lights would click on together, casting everything in a red glow. The stumps and fixtures were connected by a wire which drooped between them, then crawled up the wall and tangled with some yellow plastic. Directly translated, the light installation's name means "Man, Elf, Satan", and according to the artist, the shape of the installation (the stumps and their lights are set in a circle) is meant to reference a carnival, but also "resembles ancient superstition and fear of the forest." Like any visit to a museum of contemporary art, this one felt like a seriously random way to spend forty-five minutes. But I'm thrilled we did it, because I was recently reminded of the dangers that come when you begin to gather moss. Preparing for my visa renewal appointment at the Oslo Police Department last week, I bellyached for several hours straight. After all, I justified, they (the Department of Immigration) put me through the ringer last year: sending me to the wrong place, giving me an incomplete list of necessary documentation, reprimanding me when I showed up unprepared because of that incomplete list, telling me my application for renewal would take months to process, and so forth. Grumble grumble grumble. Then my appointment went off without a hitch. The lady at the window actually had to hand pages back to me. "This is probably more than enough information," she said. But rather than feeling elated, I was deflated. All my preemptive indignation had lit a fire in my belly, prepared to burn a hole through the bureaucratic roadblocks I was expecting because I know Norway now... and then it was left unused to fizzle there as I returned home. Unthwarted. I've lived in Oslo for 22 months now. These days, when I refer to "home" in any conversation, there's a seventy-thirty chance I'm talking about Norway rather than California. I've got my routines down pat: the coffee shops I frequent, the trams I catch, the church bells I notice. And I sometimes complain about the brown-gray slush that saturates the ankles of my jeans, or the darkness, or when I wait five minutes for the number 19 and it never shows up, or when service is brutally, terribly, haven't-seen-our-server-in-an-hour slow. These are all examples of what Corinne at the Stockholm Stories blog means when she talks about The Expat I Don't Want to Be . When the honeymoon is over and the veil of exotic mystery has been stripped away, what's left? Just another city in another country, full of the same regular people, bureaucracy, and mundane everydayness. And in that environment, expats are in danger of growing overtly critical of their new home, then sitting around stewing in that bitter criticism. "Life is a banquet," said Auntie Mame. "And most poor suckers are starving to death!" Bored? Do something. No matter where you live, there is likely someplace cool to visit nearby. 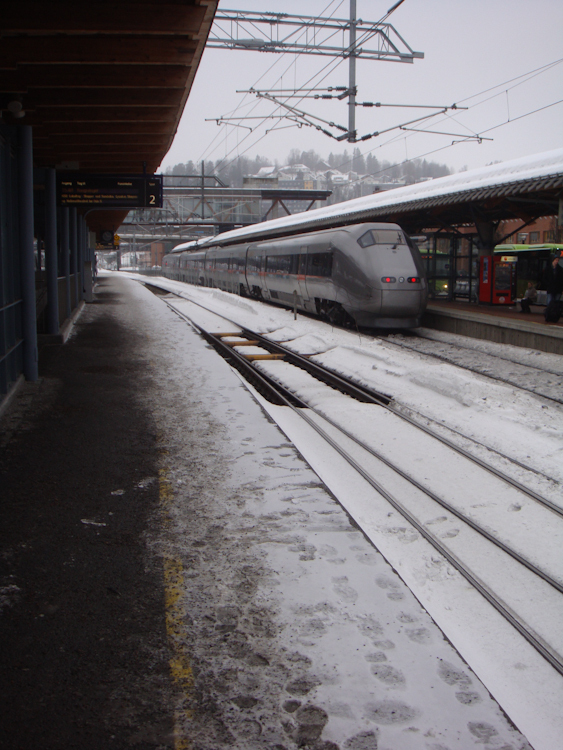 An Oslo resident visiting Asker is sort of like a San Franciscan visiting Walnut Creek. Or a Walnut Creek resident visiting my hometown of Livermore. 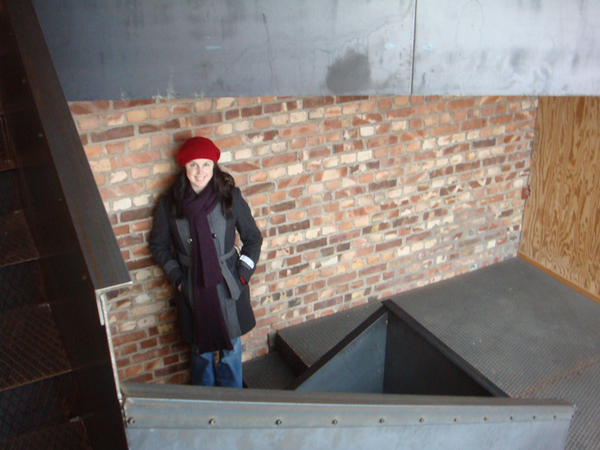 It might feel like a step down, but it's different (always a plus) and there's still something to do ! After we left the Galleri Trafo, Jonathan and I walked the streets of Asker, shopping and people watching. Children skated on an open rink to the strains of Oasis's Wonderwall playing over a loudspeaker. And all the roads we have to walk are winding. And all the lights that lead us there are blinding. At a bedding shop, we bought new pillows. It's just another weekend. We may have chosen to live thousands of miles away from our home and family, and we may be following our passions career-wise, but in most other ways, our life remains an average one. It's up to us whether average translates to boring. 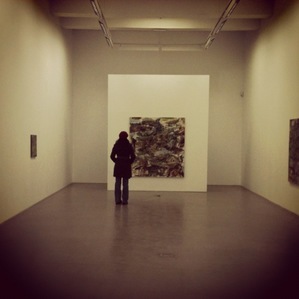 That's why we hopped a train out to a random suburb and explored a gallery. And why I hope we'll always remember that's an option.